These critters provide a little whimsy on your porch, patio or where-ever. The lightbulb bug (upper-left) is made from a burned out lightbulb with marble eyes. The skeleton is copper wire and the wings are copper screen. Pictured is a very fine mesh screen. Also available are a very open and a medium mesh. See the bottom of this page for pictures of each style of wing. The lightning bug (2nd down on the left) has a body that is an old electrical insulator often found on old railroad right-of-ways. 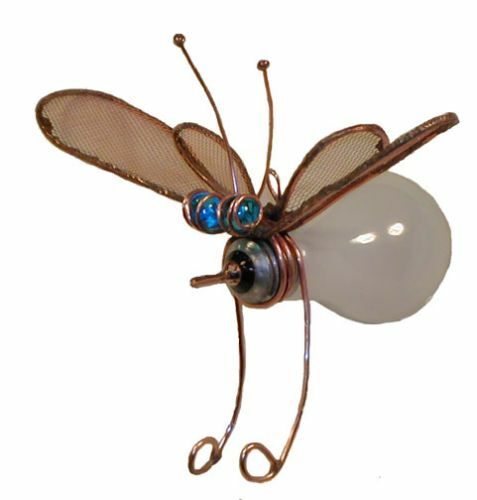 It is wrapped with copper wire, glass wings, and marble eyes. Inside the opening in the insulator is a small tea light. It is designed to sit on a flat surface. The ladybug (upper-right) has a 3-dimensional body of spiraled copper tubing. 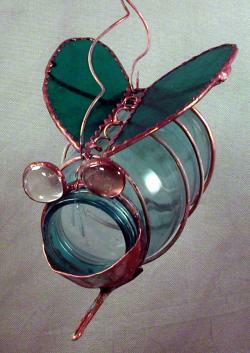 The wings are stained glass with copper wire and glass gems. 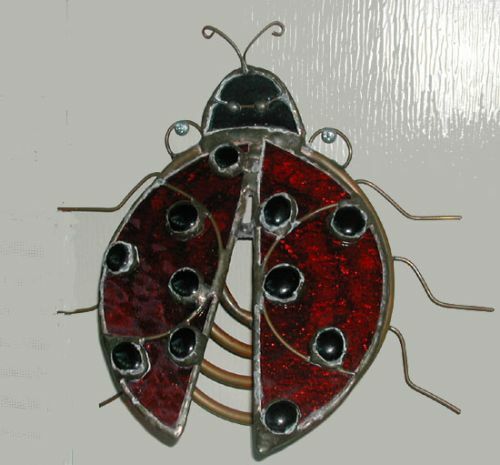 Pictured is the ladybug hanging outside the front door. 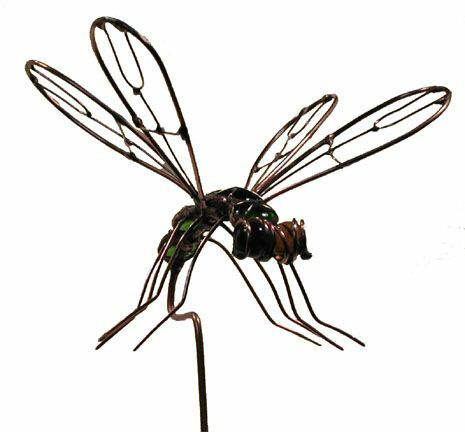 It can be made to sit in your garden on a short copper stake. The copper tubing has green verdigris. 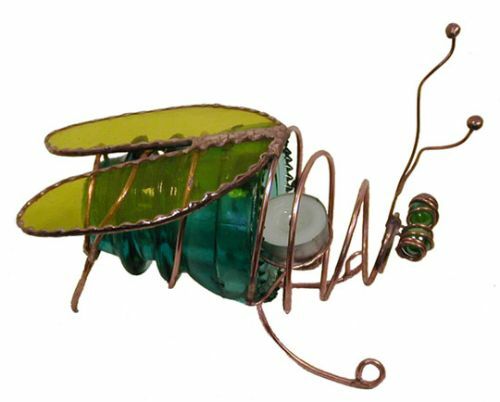 The pesky dragonfly is made from copper wire with a series of green glass gems as the body. He has marble eyes and copper wire filigree in the wings. He hoovers in your garden on a copper stake. + shipping/handling ranges from $10 to $15. + shipping/handling ranges from $10 to $18. + shipping/handling ranges from $8 to $15. The canning jar bug pictured to the left is one of the newest items in our catalog. The body is made from either a quart or pint canning jar with a blue/green tint. The wings are stained glass and can be made in any color. The eyes are clear gems. 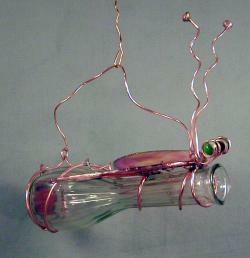 The bug is assembled using copper wire and has a small copper resevoir and perch on the front. This allows it to hold a small amount of bird seed. 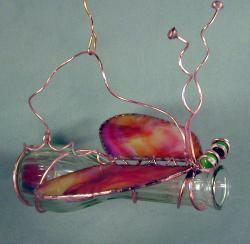 The bud vase bug pictured to the right is made from a recycled bud vase with stained glass wings and copper wire. screen with openings about 1/16" wide.